NB: The catalogue entry title was devised by the NLA from the verso inscription. NB: The number “84” is missing from this catalogue entry. 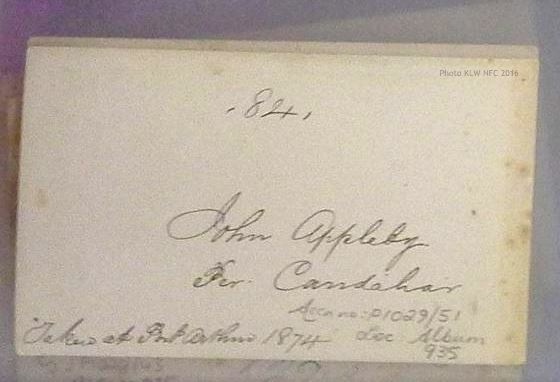 The verso (below) of this carte-de-visite of John Appleby held at the NLA is numbered “84” which was the number assigned to the copy made in the 1900s by John Watt Beattie from the glass negative of Thomas Nevin’s original capture taken at the Hobart Gaol in 1873 where Appleby was transferred from the Port Arthur prison after his petition to the Governor was declined. The inscription ‘Taken at Port Arthur 1874” is Beattie’s confabulation of facts in the name of tourism. Beattie prepared copies of these prisoner cdv’s for display in his collection of Tasmanian convictaria at his “Port Arthur Museum” located at 51 Murray St. Hobart (and not at Port Arthur) to coincide with the first of two early 20th century film adaptations (1908-9, 22 minutes – see theatre poster below; the second was filmed at Port Arthur in 1927) of Marcus Clarke’s popular fiction For The Term of His Natural Life which appeared as a serial in 1870 and in novel form in 1874. Hence the date “1874” and the place “Taken at Port Arthur” written on the verso of this cdv when the actual date and the actual place of photographic capture were respectively 1873 and the Hobart Gaol in Campbell Street. Beattie fabricated this fake history for several dozen original mugshots taken in the 1870s by government contractor T. J. Nevin because he was required under the terms of his own commission as government contractor (from ca. 1900) to market photographic imagery of Tasmania’s penal heritage to the intercolonial tourist. The loose cdv’s such as this one of prisoner John Appleby were prepared for sale and exhibition at Sydney’s Royal Hotel in 1915 to be displayed as Port Arthur relics, alongside relics and documents associated with the fake convict hulk Success which visited Hobart, Melbourne, Sydney and Adelaide. 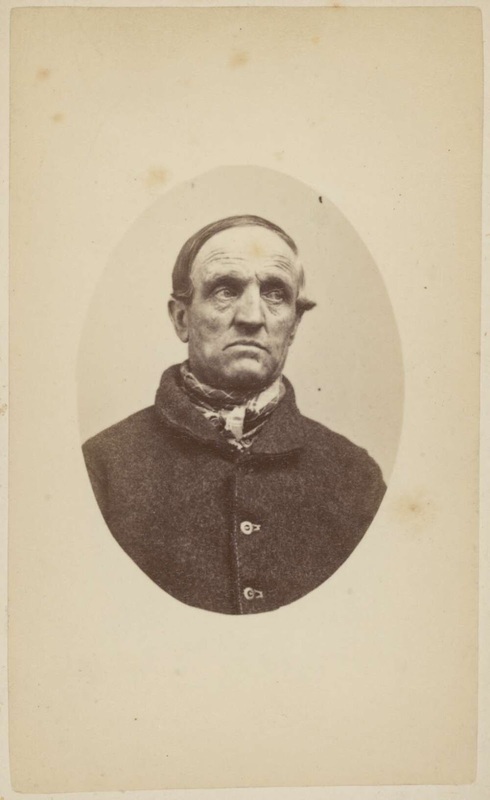 The collection of “convict portraits” held at the National Library of Australia Canberra and at the State Library of NSW in the Mitchell Collection are the estrays from these exhibitions. The NLA photographs inscribed verso with “Taken at Port Arthur 1874” were NOT taken at Port Arthur, despite the title devised by the cataloguist at the NLA from the cdv’s verso inscription, nor were they taken by the reviled commandant A. H. Boyd. These ahistoric furphies continue to be promulgated by “interpretationists” at the Port Arthur Historic Site theme park who would wish to inveigle their visitors in the same way that Beattie et al deceived visitors to his museum in the 1900s in the name of tourism. John Appleby alias Young was transported to Tasmania on board the Candahar in 1842, sentenced to 15 years for burglary. This record details his age, appearance, marital status, conduct etc on arrival. His occupation was painter and glazier. 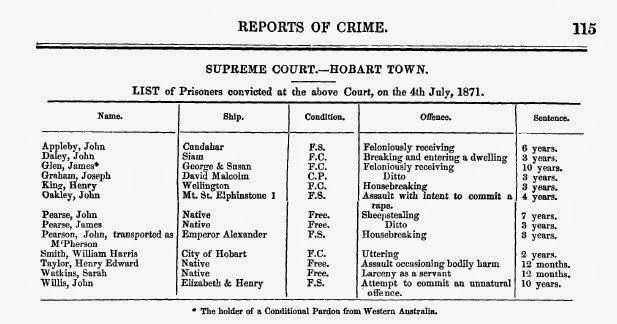 He was given a conditional pardon in September 1850 (CP), but by 1871 he was incarcerated again, sentenced to six years at the Supreme Court Hobart. John Appleby, free in service (FS), was tried in the Supreme Court Hobart on 4th July 1871 and sentenced to 6 years for receiving stolen plate. His petition lodged twelve months later, on the 11th June 1872 was declined by the Attorney-General, and on the 20th September 1873 he was transferred to the Hobart Gaol, Campbell St. from the Port Arthur prison where Thomas J. Nevin photographed him on being received. Two years later, on the 13th August 1875, the residue of Appleby’s sentence was remitted- see detail of record above, column extreme right – viz:. From February 1872, when the Attorney-General the Hon. W. R. Giblin commissioned Thomas J. Nevin to undertake the systematic photographing of prisoners, those prisoners whose petitions to the Governor were declined were among the first to be photographed. 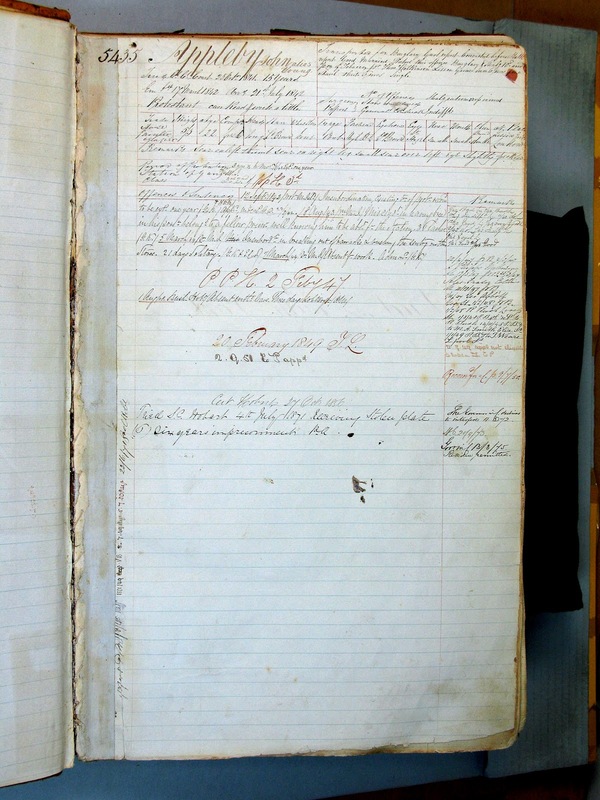 With the assistance of Frederick Stops, clerk and “right-hand man” to the A-G, Thomas Nevin collaborated on collating information on prisoner records, both visual and written through the 1870s into the mid-1880s. John Appleby was photographed again in the fortnight prior to discharge on March 4th, 1875, per regulations laid down in the Victoria and NSW Police Acts 1871-1872, adopted in Tasmania after the visit by Victoria’s Solicitor-General in January 1872.